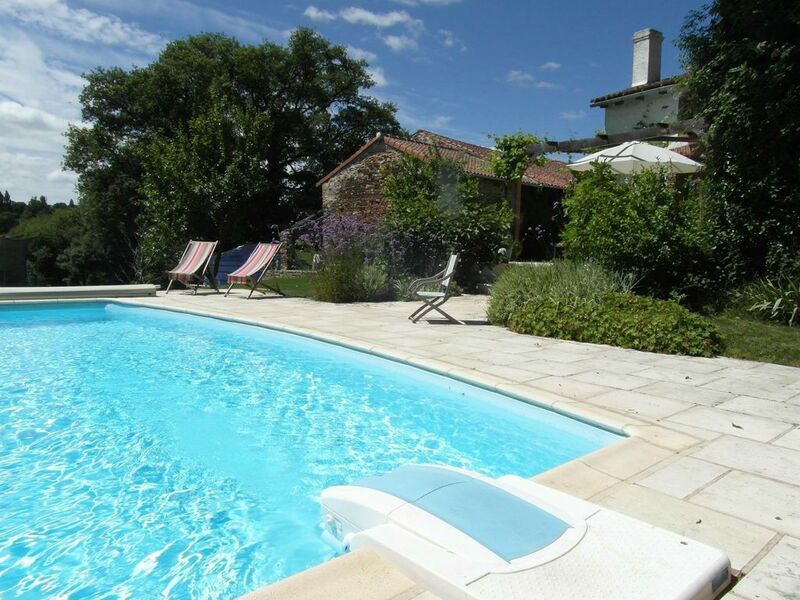 La Maison Mignonne is a charming, newly-renovated stone cottage, situated in a quiet hamlet in the Haute-Vienne region of South West France. It has been sympathetically restored, combining traditional character with contemporary comfort. There are two bedrooms (one with a double bed and one with two singles), bathroom (with bath and shower), and open plan lounge-kitchen downstairs. All mod cons are provided: dishwasher, washing machine, microwave, fridge-freezer, wood-burning stove, TV. The gite comes with a small private front garden and there is also shared use of the owners swimming pool (8m x 4m), games barn (table tennis table, full-size American pool table, dartboard) and access to 2.5 acres of land with views towards the Blonde mountains. The Gartempe river is a short walk away and is a lovely spot for a picnic or some fishing. LARGE GROUP? Up to 10 people can be accommodated if you book our beautiful Mongolian Yurt as well - please enquire for details. Julian, Cathy and Dylan (aged 9), 3 cats, 1 dog, 2 goats and three chickens. Note that wifi is provided via a dongle which operates through the 3G network. Being so rural, the signal is not great - fine for checking emails but not for streaming films etc. UK and French channels available - please specify preference at time of booking. Séjour très agréable au calme à la campagne dans un gîte très bien aménagé et joliment décoré . We are about halfway between the historic cities of Poitiers and Limoges – the former is the picturesque capital of the Vienne noted in particular for its Romanesque architecture, and the latter the bustling capital of the Limousin famed for its porcelain industry. There are plenty of delights to explore across the region, whether you enjoy great food, history, culture, wildlife, sports or adventure. We are happy to help tailor your itinerary to your particular interests. Must-see destinations include Futuroscope, La Vallee des Singes, Lac de St Pardoux, Oradour-sur-Glane, and Mortemart.